We recently designed the exhibition catalogue, Harlem: In Situ, for the Addison Gallery of American Art, Phillips Academy. The catalogue, along with the exhibition, looks at art depicting one of the country’s most distinctive neighborhoods and cultural epicenters. The vernacular of the perfect bound book was inspired by the place itself, an urban grid of elegant beauty, built of brick and rich in character. The cover, a full bleed photo of Aaron Siskind’s Facades, sets the stage for this visual dialogue. Inside, impactful typography rich in detail and a color palette reflecting the neighborhood’s facades bring the story to life. The title page establishes the graphic tone of the book and is supported by Dawoud Bey’s Two Men Walking. 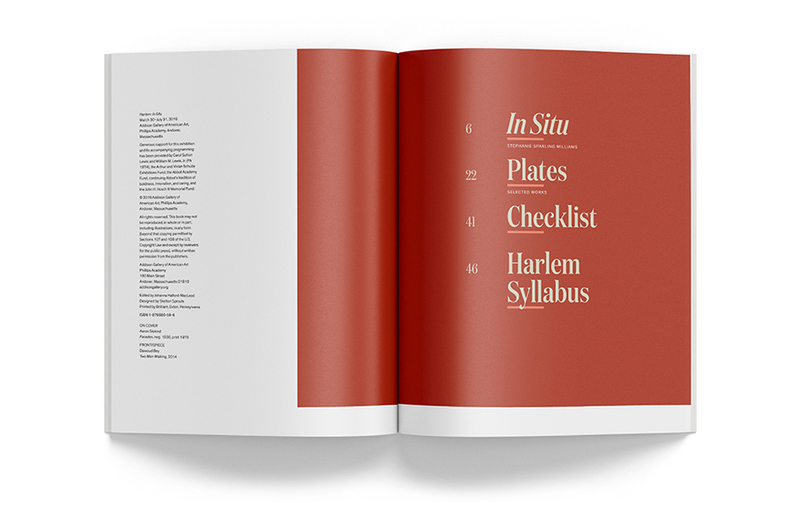 The table of contents begins to define the grid, typographic hierarchy and color palette. The book leads with an insightful essay by Stephanie Sparling Williams. Supporting figures include callouts and artwork from the exhibition. Generous white space is used throughout to elegantly frame the figures and essay. The artists represented in this exhibition vary in medium and approach. This visual diversity, along with Williams’ essay, provided inspiration for the design of the book. Many of the pieces from the exhibition can be seen in the Plates section of the book. Artwork shown above is Aaron Douglas’s Power Plant in Harlem, Lucien Aigner’s Harlem Unemployed I, Aaron Siskind’s Facade, Unoccupied Building, Jacob Lawrence’s Kibitzers, Alice Neel’s Two Girls, Spanish Harlem and Kehinde Wiley’s Officer of the Hussars. A complete exhibition checklist is also included in the book. A unique addition to the book is a bibliography for young readers. A list for adults is also included along with a selections of poems for reference. Both are excellent resources for anyone interested in the subject.